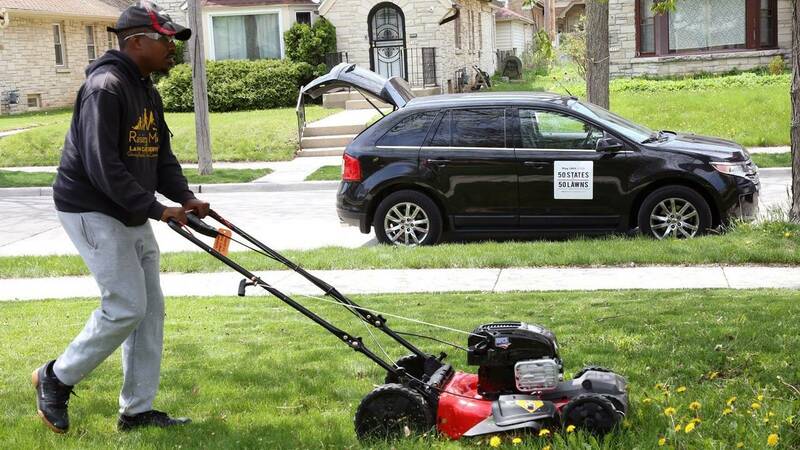 (CNN) - Rodney Smith Jr. found his purpose the day he came across an elderly man struggling to mow his lawn, and pulled over to help. "That night, I decided to mow lawns for the elderly, disabled, single moms and veterans," Smith told CNN. Today, that idea has expanded. This summer, Smith is traveling to all 50 states to mow lawns for people who need help -- for free. The Bermuda native graduated from college with a degree in computer science, but wanted a change. He decided to pursue a master's degree in social work in Huntsville, Alabama. It was in Huntsville that he started by mowing lawns for free. He made a goal -- to mow 40 lawns by the end of winter. But he reached his goal so quickly, he decided to up the number to 100. It took him a month and a half to get there. "This is what I believe my purpose is in life," he said. Last year, Smith, 28, decided to try something new -- travel across the country to mow lawns for people in need. In May of 2017, he began his first trip to mow lawns in all 50 states, which he called "50 States 50 Lawns". One year later, he's doing it again, but this time, he's mentoring kids along the way. "I'm just a man on a mission by God," he said. That mission had him in Jackson, Mississippi, on Friday, with his schedule taking him to Shreveport, Louisiana, on Saturday; Little Rock, Arkansas, on Sunday; Oklahoma City, Oklahoma, on Monday and so on with a different city almost every day until he wraps the effort with trips to Alaska and Hawaii in July. During this "50 States 50 Lawns" trip, Smith is encouraging kids he meets along the way to take up the challenge. He's stopping at schools and community organizations to teach kids about lawn mower safety and community service. To defray the cost of his expenses, Smith said he's funded by donations, including those by lawnmower companies that donate equipment. He takes submissions to decide what lawns he'll mow, both on his website and on social media. He said it's important to teach kids about service. "It's about letting them [kids] know that no matter how young they are, how old they are, they can make a difference, and it doesn't have to be with a lawnmower," he said. "They [kids] can make a difference one lawn at a time," he added. Single mother Alanna Cavett from Mississippi has nine kids, and six of them live at home. Between work and her children, she doesn't get the chance to mow the lawn very often. Once or twice a month, her neighbor will help her out, but she feels like her lawn is usually a mess. "It seems like such a little thing but for me it's not, because I'm very busy at work and at home with my children," Cavett told CNN. "There's not enough hours in the day." She said her kids learned from the experience. Though she teaches her kids about kindness, Cavett said it's entirely different for them to learn about kindness from someone they don't know. "It was kind of a shocking experience for them, and it's hard to explain, but they really haven't seen a random person do a random act of kindness," she said. "That was shocking in a way I can't explain." Smith is over halfway done with this summer's "50 State 50 Lawn" campaign. Next summer, he hopes to start a "7 Continents 7 lawns" campaign to continue to spread his message of service around the world.